UXPin is the UX Design Platform that gets it right. Sign up for a free trial. "Great design tool for wireframes, UI design...and coming soon Interaction design"
UX Pin makes it easy to create mockups for low and high fidelity designs. They have dozens of libraries with various items to be used in a design, making it easy and fast to create mockups and designs. The designs are easy for stake holders to view and provide feedback on as well. We often have review meetings where changes are make quickly in the design mode, and the preview mode show the changes in real-time. The stake holders and product managers love this. It has significantly reduced our design time across our organization. They haven't had an update in a while, so there are many things that are a little buggy. Some of the designs we have create are fairly complex, having hundreds of layers. We also have dozens of interactions within the designs. The system slows down a lot with so many variables in the design. It makes it difficult to work on some designs, where a change that should take 2 minutes takes 5 because of the slowness. Not to worry, an update to the application is coming in November 2015 (next month from when I write this) that will eliminate this problem. It's a great tool for designing. It is much faster to do designs than in Photoshop. We are looking for way to produce UI and UX designs quickly and easily. We also needed a tool to interact with the team to allow for reviews and task tracking and changes on the designs. UX Pin does a great job with this. "It works...but I'd love to explore more options." I appreciate the no-frills prototyping ability it has. Myself and my team typically design smaller, informational websites or small ecommerce shops and don't need to be showing extensive wireframes/prototypes for them, but rather a basic, functional representation of a website for the client to test and approve. As an avid Adobe user, I tend to be biased when software doesn't "function" like Adobe. This includes certain key commands - in particular, bringing objects to the front or sending them to the back. In UXPin, you have to right click + then click again to do this, which gets tedious. I also have noticed small bugs here and there, especially whenever they roll out a new version. For example, a client recently wasn't able to get links (with added interactions) to function properly. It also kind of drives me crazy how the artboard needs to have a set size - we typically design sites around 1400-1600 pixels wide but if a client is viewing this on a laptop they have to scroll horizontally quite a bit. I understand that UXPin has the ability to make responsive screens but this is often not a step we have the time to take if we're just presenting a simple desktop wireframe. One more thing that I wish they would change is how you can't click on links when viewing prototypes in comment mode. We often leave comments on elements, alerting the client that they're clickable, but then the client has to first switch OUT of comment mode in order to click on them. A simple + straightforward way to present wireframes to clients. Even our most technology-challenged usually manage to figure out how to navigate the prototypes. Intuitive interface for those who want to mount navigable wireframes quickly. Even for beginners, there is no need for a prior explanation to start using. Libraries are another positive point: they show features for simulation of social media, elements of the Android system, IPad, Iphone, and others, which makes the navigation experience even more immersive. I also liked the email service. They were very cordial and solved my problem, surpassing my expectations. I had problems with the button "delete" and "duplicate" screens, because at least twice, I accidentally clicked the delete button instead of duplicate. Again, I clicked very quickly on one of the pages, and again, I mistakenly clicked on "delete". The proximity of those two buttons was not a good one, in my opinion. Sometimes, when I click on an element, it leaves the place without I move the mouse, getting a few millimeters out of the frame. The menus on the left side (library, screens, pictures) were very tight. I think the place where all the images used in the wireframe are located could be somewhere else, to give more space to handle the library items and the screens. Being intuitive, it was quick to create the first sketches of the project, and this agility was important in the process. Like any program that is intended to create wireframes, this one helped me to predict navigation and design problems. Also, it helped in the search for references in the solution of these problems, through the elements of the library. "Low or high-fidelity wireframing made easy." I enjoy using the elements with animation built in, like sliders and tabs. These can be dragged to a canvas, and immediately put to use. There's a lot of animation options and they're constantly updating the tools with new options. While there's a Sketch integration, I've found it to be glitchy at times, especially with several designers syncing up to one UXPin project. Constant iteration is great, but at times its tough to keep up with the constant changes, especially when things move within the interface. It can be annoying to try and find the layers or effects panel when they change location mid-project. We're trying to convey what a client's website or app will look like, and UXPin is the tool that shows them that skeleton of how their site might look, feel and function. Being able to get their feedback within the tool and respond allows us to work quickly and efficiently to meet their needs. "Solid Program and Getting Better"
- I like that they are always improving and adding features. - I like that it is web based so that I can use it on any computer without having to download anything or connect to a server for the files. - I like the Sketch and photoshop integration. - Printing is problematic. Straight printing from browser doesn't work well and exporting to PDF for printing can be buggy and limiting. - Have had issues with bugginess in the past, but this is improving. Ability to quickly mock-up and prototype ideas to try them out and test them before completely designing them out or developing them. "I was using extended trial period to test if this tool will be good enough to make decent prototypes"
drag and drop is nice, also the fact that you can use many built-in UI elements and export option. I liked making animations and live prototype which i shared with my coworkers. Wire-framing was fast, tool is easy-to-learn and best thing is that it beats pen and paper wire-framing to the pulp, because changes are fast, immediately seen and it has nice grid. Also, customer service was very nice and professional, they answered in mannered timeframe and helped me even if I was trial-user. At the time I was using UXPIN, I had to make prototype for website, and mockup was very detailed which resulted in slugish behavior of the platform, loading time was significantly longer. Other than that, I can say that I didn't like. If you need fast and easy-to-learn SaaS solution for mockups (both wireframes and prototypes), I recommend you to try it, it has free trial period to ensure that they have all that you need. My personal opinion that UXPIN is very good SaaS for wireframing and prototyping, but I've seen and used way better software. My bottom line is - just use trial and try it, maybe it meets your every need. "UXPin is solid, all-around prototyping software"
I really like the template libraries, the interaction flows, different states for each element. Workflow is easy to pick up, if you are familiar with Mockup tools and/or some Adobe products. The device simulation in combination with the different states for each item are probably best in class. They get that part right. The Freemium model goes way too far here. It is totally not transparent what you are buying. Most innovative and new features will be perfectly working during the 7 day trial, but if you upgrade to a real plan you better be willing to spend the big bucks. Otherwise you might miss some important features once you are actually a customer. They have things like custom CSS, import your fonts and typekit integrations only available to enterprise customers and free trials. You have to understand that there is no official price for the enterprise plan, the second most expensive option is $100 a month. That is $1200 a year for a web based prototyping tool and it doesnt give you access to all the features. I assume the Enterprise plan must be at least double the price, if they do not declare it on their website. Their business seems to have no interest in the user needs, once signed up. There is not even a way to contact support from the dashboard. They however push notifications through your dashboard with to test features in hope you upgrade to enterprise, because you cant live without them after testing them. Make surre you understand, that features will be missing after your free trial converst to premium plans. I've been using UXPin for a couple years, and it's my favorite tool to create clickable wireframes and mockups. I tried a few others, and they were all really slow and unstable. UXPin has been consistent and reliable, and always improving their featureset. Something still feels off about the editing tool; I still prefer to build everything in Creative Cloud and import into UXPin. I'll probably give the editor another shot when I start my next project. It's easier for nontechnical people to visualize the app or website being created if they can click through wireframes and mockups. It also unifies the vision of the project so that the programmers, designers, and clients all know exactly what's being made. "Good starter tool for prototyping"
Large library of elements and icons with good sharing and commenting features. Some features are harder to understand, link symbol use. Also, some menu options and the general organization of projects is a bit confusing. Wish there was a better way to use recurring elements and then modify them. For example: add a custom element as a 'template' and then modify it for a single prototype. We can no move from concept to shared prototype and track job progress. The simple and clean user interface makes it easy to use. Also, it's not a big software like Adobe, so it's less complicated and doesn't take much time to be profession on it. It comes with the documentation and design system and documentation. These features still doesn't quite work the work we need. If your design doesn't need to be pixel perfect, UXPIN is a very good choice. It comes with lots of useful tools and features. We use the system to do mockup and communicate the mockups with our engineers. It makes the collaboration easy as the engineers can view specifications and documentation right in the mockups. "Really good software for UX designer"
Is't really innovatiw and trendy SASS software for mockups creating. It's alternative for Axure and in a lot of cases beter then older brohter. Thius guys are from Poland & making a good job. I love a click, slide animations, they are awsome. I love a import pfrom Scratch and Photoshop, it's help, and accelerate designing Hi-Fi process. In bigger projects UXPin working slow, have problem with projects big like 200 screens. Ofcourse You can split Your project into a smaller pieces but in Axure You don't have this problems. If you are using Sketch it is essential to name and group all layer properly, as it cab be difficult to sort out the layer structure when imported. "UXPin is a highly productive prototyping app." The application itself is well-designed and appealing to the eye. 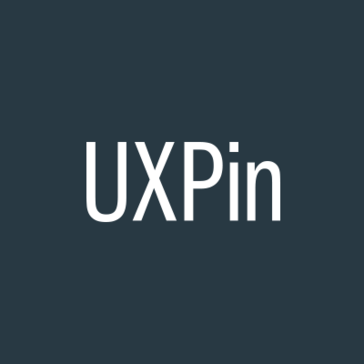 Unlike many other prototyping applications, UXPin has a coherent interface. The interaction and animation system is easy and intuitive, which contains selectors and combinators very similar to those used in production code. It also comes with a huge standard library of elements, allowing one to get started more quickly. The edge snapping is somewhat primitive. It would be very helpful if the snapping were more advanced as in Photoshop. Use it. I've looked at a lot of prototyping applications with but UXPin is simple and effective, and covers most prototyping needs. I design small interaction models for websites to improve user experience. A prototyping application has allowed me to more quickly get a design out of my mind and onto the screen. I really like the Design Systems feature, and all of the other automated handoff and design spec related features. They really seem to help real well with consultant roles since being as lean as possible on product design projects is always key. I don't like that the Photoshop integration isn't as good as the Sketch integration. It's understood Photoshop is probably more difficult to integrate with because of the limitations by Adobe, but I feel like it's probably used by more users than Sketch. The integration is cool and good, but still not as good as Sketch. In addition, the Photoshop layers imported are not editable in UXPin. UXPin, although very useful and industry leading, is mostly geared toward single-product companies and less for consultancies. For consultants the only real subscription plan that makes sense is the Enterprise level. The great thing is UXPin seems to be willing to work with Enterprise subscribers on number of users and potentially pricing. The design systems feature will prove to be very valuable for those product teams who use it. "Initially showed promise, but ultimately it was a disappointment!" I enjoy being able to design simple UI and wireframe within the same tool I plan to use for a clickable prototype as it helps to speeds up my workflow. It has helped to illustrate our ideas and direction with clients who struggle to understand how their content will translate to an onscreen format. I really enjoy the fact that it's cloud based. I can work on my projects from multiple locations and share my projects with coworkers. I appreciate the collection of pre made elements which saves me a huge amount of time. The preview mode with client comments is a really powerful tool to develop websites and apps. I really like the new interface, it's easier to navigate through the site plan. In the new version, I felt that the smart elements are unstable. Some of the smart elements were loosing some information when installed in new pages. Since the redesign, some elements are harder to find : for example the export to png, pdf and html button. I have to interpret business models and create their web version. My job is to be the bridge between clients and web developers. I create interfaces in wireframe and I also do the design. Using ux pin helped me become more flexible with my schedule, since it's cloud based. I also, with the help of the comments in the preview mode, gain clear feedback from clients directly on the wireframes. Overall, UXPin is a great tool for user testing mock-ups. It's simple and easy to navigate. I appreciate that the app allows users to quickly test multiple different platforms; i.e. iPad, phone & computer layouts. It can be a bit clunky to navigate through with bigger projects. While it's nice to have built in tools to add to the design, they are not fully customizable and I'd appreciate more design options. I also had issues deleting wireframes - it's easy to confuse with the duplicate button and each image upload has to be deleted individually. It's really great for user flow when it comes to UI. Allowing for non-technical users to interact with your mock-up helps them to realize how your app is intended to function and can point out any early design flaws. "Super easy to learn and use!" Easy to learn and pick up with user friendly interface. Ability to drag and drop and organise project easily. Also the ability to generate links makes sharing projects and receiving feedback with teammates and client very convenient. UXPin also allows users to export design project from Photoshop and Sketch and bring it into UXPin. I wish it has more design options such as fonts and other customisations. It is still more efficient to use it for simple low-fidelity prototype to avoid having bugs. It is also quite expensive to purchase the tool so best to try it out first before buying. Its a great online prototyping tool for anyone including people with not much knowledge of design so that everyone can collaborate together. Try it out online first before purchasing it. you can receive a trial period before it stops asking for the purchase. My team and I use it to mock-up fast efficient low-fidelity prototypes for web and mobile. It is very useful to create user flows and posting notes and comments on each other's design. I also use finalised photoshop UI and import it into UXPin to create user flows. "UXPin is good, but I wouldn't recommend it to everyone"
The drag and drop features are great. Once you have used it for a bit everything feels very natural. UXPin allows you to prototype both mobile and desktop apps which is a plus. Collaboration features are also pretty descent. The wireframing features are solid. UXPin is great, I am not taking anything away from what you can do with it, but the learning curve feels a bit steep. I would personally pick some like pixate or marvel over UXPin. After you use it a bit it feels pretty good, but it isn't as fast to learn as some other options out there. Pricing feels a bit steep too compared to something like marvel which has a great free plan. Its a great piece of software, I would recommend checking something else out like marvel or pixate if you are something that is easy right out of the box though. UXPin definitely has more control once you get used to the interface. UXPin helps me solve prototyping problems for both mobile and desktop applications. It has a drag and drop interface with easy collaboration features for your design team or clients to work easily together. "Great for user testing. Some bugs"
They are constantly updating to make a better experience. There are bugs we have to work around, especially when conducting user testing - e.g. if they click in the wrong spot and end up having to start over. We are able to build quickly and make changes. Those who don't use it regularly are easy to ready to present it to clients or test. Some bugs. Still limited in the types of experiences we create. If we are testing with it, we do need to clear out cookies in browser after every test or we run into issues. Concept testing, resonance testing to create user-centered experiences. "UXPin has heart, and a harsh learning curve." UXPin totes a drag n drop user interface and no coding needed to get up and running with a prototype. The prototype is potentially strong enough to begin developing the real deal, right out of the tool. In practice, UXPin doesn't simplify a process, just offers a different route. If you want to utilize the bootstrap (or any other framework) you have to be intimately knowledgeable about said framework. The work flow didn't speed anything up for me, and I couldn't seem to find the balance of, "I'm learning" + "I'm doing real work". If your job/role needs someone in "prototype mode" and it has to be in the browser, I would imagine this is the best tool for said requirements. Unfortunately it was so hard to learn, and at the time I couldn't find any workflow help - so I just don't see how life is better with this tool. The business problem of validating software upfront seems like a great thing. But with this tool, I never got past a hyper-basic prototype that I ended up hand-coding because I was fighting the tool too much. "One of the best but can still improve"
For me the best feature is the real-time responsive breakpoints. I have yet to see an online to do this feature better than UXPin. However, it isn't perfect and sometimes doesn't show the right screen size causing clients to end up bewildered and often confused. Loading times can be really long and slow. Sometimes the pages get stuck on a loading and never load at all. This can be extremely frustrating and my clients really don't like this at all. Try it first and see if you like it. Personally I feel it's one of the best online wireframe / prototype tools out there, but with quirks and big room for improvements. The responsive breakpoints are really awesome, the personas are great too, but slow loading times and quirks with breakpoints not showing the right size can often times be very frustrating for both users and myself. Oftentimes it's mobile to desktop e-commerce or user administration tools. Wow, there's so much to say, this maybe my favorite prototyping tool that I've used so far but if I had to choose the best part of the product I would say the fact that you can collaborate on one screen and see what your fellow designers are working on without having to constantly resend. There are a few things I wish it had more options in the design section. It is pretty basic so I'm not able to do anything too detailed but it matches being a prototyping software. I don't really have too many negatives to say it is very simple to use and easy to learn. I believe the creators of the product took a lot of time thinking about the product and common problems designers have when building it out. Just use it! You'll understand why I love it so much! So many! It has helped my team create common style guides to follow and build out beautiful well thought out wireframes to show to the client. I think the biggest problem this helps solve is time, we are able to get things done faster and work together on something. "Was a great experience but sometime little bit difficult"
The options for generate new projects and the multiple graphics assets they have available on the menu. The best option that I love is more was de documentation because with all the options I can create great documentation for my project. Another one thing is all the ebook's that the UXPIN team create for help. Sometimes isn't to usable because was difficult to move from one screen to another. Or when you test a new prototype was difficult to fine where you can comment. The management for all project's is a little messy because isn't clear the purpose for many buttons, for example delete, rename o change general info of that project. The easy process for develop and design new prototypes and the easy way for share ande receive comments for external user ande the client. Another benefit was export the views to PNG or PDF and with this become easier to me create presentations for my client. "Great way to get started with prototyping"
I have never used a UI design tool before, and don't even know how to use PhotoShop, so I was starting from scratch. UXPin has a simple UI, excellent tutorials, and a wealth of help documentation -- plus a responsive sales and support team. There is a fair amount of latency for some operations, but arguably that's the fault of my ancient MacBook Air. Read the reviews so you know which features they don't have (like support for your own custom fonts; we don't care since we just use Google Fonts). We are working on a major redesign of our running prototype on the road to V1.0. We need to get customer and executive blessing before the team gets down to work. Using a tool like this will hopefully get me better feedback quicker; I haven't yet shown them the finished result, though. "UXPin is a great tool for collaboration!" I liked how easy it was to collaborate with other team members. It was user-friendly enough for non-designers to be able to contribute, and changes were reflected on projects almost immediately. Not sure if it's been changed now, but previous versions didn't allow you to recover older versions or accidentally deleted versions of your projects. I had to email support a couple times in order to recover, which was a minor setback in completing projects on time. If you're looking for a prototyping tool where everyone (designers and non-designers) can contribute to the process, consider UXPin! My team used UXPin to create and feel out different prototypes for our upcoming website. It was easy to create user flows and comment on each other's work. "UXPin High Level Design Platform"
Among plenty of features: cross-platform (web interface) and device agnostic, cloud based, photoshop and sketch import, sync functionality, highly customizable, many functions are automated (Low code development platforms), full stack and innovative, designers oriented. There is no "for developers" category. Some features can be customized by developers. Build for designers by designers. For those who want to build a design system. Prototyping, making sketches and mockups, accumulating / categorizing resources, making an order out of designer's scattered and unstructured data. "Great option for quick GUI prototyping and user flows"
Its easy to copy a canvas, tweak a few things and add click behavior to quickly model a user flow or interaction. Also the URL sharing, PDF exports and commenting make it very client friendly. Working in the browser and using a Flex(?) web application feels clunky. Also some saving/updating inconsistencies caused distrust in the program. For example, I would update button text, navigate to a different canvas or export to web view and the text would not be changed consistently. UXPin is a great option if you want to stay in a "medium fidelity" prototype world. I probably wouldn't invest a ton of time or energy into something because of the saving/updating issues I experienced and being worried about losing work. Things seemed to bog down a bit with too many elements. I found it great for clicking through user flows and sharing with clients with a unique URL that they could navigate themselves. Wireframing and interaction design. I don't think this is the right choice for designing a complete end to end web application (but it certainly could). Most of my uses were 6-10 different view to work through a specific user flow. But there wasn't any movement. Just A > B > C to get sign off from clients and communicate intent to design/development. It was better than whiteboarding (higher fidelity) but less time investment than a browser based prototype or full photoshop mockups. "Friendly UI. Easy to learn and use." It is easy to learn and use. The drag-n-drop widgets are very useful to create wireframes. It is also easy to organized projects. Also, I like it generates links of projects that are easy to share with teammates. I wish it could support more fonts or make it customizable. I cannot make mockups if I want to use a font that is not in the list. For a web app designed for banking industry. The project required a particular font to use. I couldn't make mockups in UXPin because they didn't support that font. But it was still good to build wireframes or import mockups from Sketch into UXPin. "Best collaboration tool for client presentations"
"good tool for making wireframes"
very easy to use. very easy to learn. huge library to help you make your designs. drag and drop is a huge plus! give this a shot but there are other platforms out there that might be a better fit for you. uxpin helps me solve wireframe mockups for design. There is a bit of a learning curve but nothing that reading the documentation can't fix! Mehh. I think they have some good ideas, but as a web app, it's hard to get the reaction time I'm looking for when I work. They do have some great content via ebooks though. It's finicky. I think the design could be cleaner. I think it could be more responsive. It doesn't solve anything other products don't do better. Bringing animation into it.. Can be easy to get high fidelity distracted and not concentrate on low fidelity, fast passed mockups. I like the included assets. Makes it easier to get started. Also easy to share notes and collaborate. The actual interactions and transitions leave some to be desired. Very good for a cloud based program - sometimes it would be nice to have something installed on desktop though. Creating prototypes for digital experiences. "One of the most reliable sources for makers"
The amount of detailed resources on processes, tools and skills are good. Their prototyping solution is not good. Use their resources and try their software but make sure to compare it to other tools in the market. Their solution is lightweight and fast but not packed with the most advanced solutions. Teaching designers on the tools and skills of the various designs. "Positive but room for improvement"
That it has a over abundance of ui elements for you to use. How overly complex the software is and that it does not really have a lot of value for you to use it once you are done wireframing. Use it if you must. I like how similar the layout is to Photoshop, it makes it easier for me to learn how to use it. I also like that you can add multiple collaborators to a project. I haven't used it long enough to find issues. We have been redesigning the corporate website and uxpin has allowed us to make a functioning mockup ready for development. "Nice way to engage users"
Their recent update of animation. Its too good. And work flow is very easy an handy. Pricing , its competitors have less price. Take some time to regonzied it . Take some time to become handy with it . Then only you will get how beauty it is .You will like , I am flying in wires. Its solving our one of the major issues "Time" .Doing work is very easy . I can't work with the parts of the screen. Only simple tasks can be done. "New and Improving (But didn't quite meet my needs)"
It's mostly drag and drop so it's easy to use and offers higher fidelity tools for creating quick and dirty prototypes. I found support for any level of advanced interactivity to be lacking. Browser-based, no need to install software. Ideally, should make for realtime updates and easy sharing with collaborators. Clunky and proprietary. I found the tool to be difficult to use and would never recommend widespread usage with collaborators or clients. It felt like using a bad clipart tool. It's an easy way to do the digital equivalent of sketching ideas. Everything is drag and drop, easy to resize, and easy to share with someone remotely. Export features leave much to be desired. Biggest business problem it solves is communication between multiple remote parties. * We monitor all UXPin reviews to prevent fraudulent reviews and keep review quality high. We do not post reviews by company employees or direct competitors. Validated reviews require the user to submit a screenshot of the product containing their user ID, in order to verify a user is an actual user of the product. Hi there! Are you looking to implement a solution like UXPin?